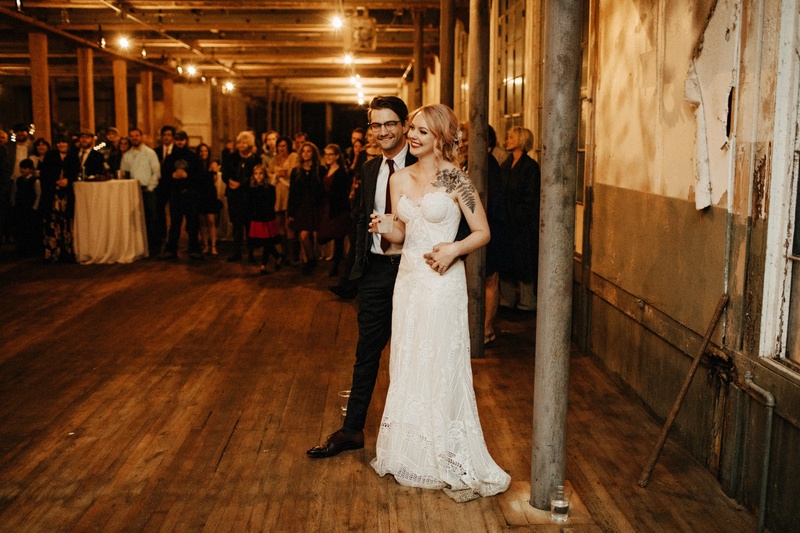 Waterfalls, Old Mill and Factory wedding. Preface. I first met Halie and Alec in Oregon when they came to the west coast for a vacation and for some engagement photos, you may remember seeing their butts here. I always expect people from the south to have really heavy southern accents, but theirs was cute and understated. The more time you spend with couples the more you learn about what makes them unique. One thing that really stood out to me was the way that Alec dotes on Halie. Yes “dotes” because sometimes you need to use words from 19th century British literature to accurately describe people. Alec is cool, I mean plays in a band, records in the studio and is super sharp kind of cool. But man does he love Halie. Halie is the sweet, beautiful, quirky human with a radiantly positive energy that just lifts the spirits of any room she is in, and you can tell that Alec just worships her. I love the way he looks at her, it’s the way that everyone wants to be looked at by their person. Like he won the lottery. Rehearsal Dinner. There were these little hand written notes of love professions from Alec to Halie scattered about the tables. I asked Halie “Oh is this how he proposed?” Halie laughed and said “Oh he proposed more than once.” Apparently he staged multiple proposals, on paper, in public, at dinners. What a romantic. Ceremony. I didn’t even know there were waterfalls in Georgia. I think I’m slowly opening up to the world and realizing that there are beautiful places everywhere, you just need to know where to look. I love saying cliché things like that 🙂 But honestly coming from Oregon, I had pretty low expectations. I was more than a little surprised as I walked up to Toccoa Falls to see this almost 200 ft waterfall. Halie & Alec stood atop a rock at the base of the waterfall with their close family sitting on the rocks below them, and 150 seated guests witnessing. Reception. Turn down a random unassuming road in rural Georgia and you come across this old mill next sitting next to the bank of a river. It looks like it’s from the turn of the century, from the real industrial era when we made everything. It’s huge. This is the kind of place you drive by and think oh man that would be such a cool place to fix up and turn into your giant art studio. The kind of place you want to sneak inside just so you can see a little piece of history. Old wood floors, paint peeling ceilings, weird architectural quirks, not to mention all the windows. Unfortunately, this is not a wedding venue, and I can’t give out the name. The owners don’t want the name shared at all because it’s not their intention to make it a wedding venue, so please don’t email and ask the name. However, this should give you hope to go find your own mystery building and beg the owners to let you celebrate there. Alec is a musician, so it’s only natural that he wrote a song for Halie and her dad to dance to. Alec’s close friends and bandmates played it as Alec and the crowd looked on misty eyed. I asked Halie multiple times if Alec was planning on singing a song, and she said that he had refused. But of course, after their first dance, after Halie and her dad made everyone cry, after Alec and his mom shared their emotional moments, Alec stood up and walked over to the mic. He then played guitar and sang a song to Halie, the song he wrote to her years ago when he was first asking her to be his girlfriend. Eyes locked, he sang directly to her. A heart shaped piñata hanging over the dance floor was ironically stabbed by Alec splitting in half and revealing small bottles of alcohol. Fireball. Dancing ensued and the party was on. Instead of feeding each other the traditional piece of cakes, they fed each other cheese, because why not. Before the party ended, Halie had one more surprise, a gift for Alec. He was lured outside by his friends to find Halie standing there with a brand new motorcycle. I told you these are cool people. It’s funny observing and capturing weddings like this play out, it seems like some movie unfolding in front of you. Like some brilliant love story being written. Thank you for capturing this day for my sweet Halie. You did an amazing job!!! Halie + Alec could not have chosen a more perfect Photographer for their magically perfect day.. Thank you Sara for an amazing job !!! Great set of outstanding images! Well done! This is everything I want in a wedding. So f'in cool! And your photography is always bloody gorgeous Sara. One word, Perfect!!! One of my favorite weddings... Well done Sara.